Some bank robbers choose the wrong abandoned house to hide out in. last week Mrs. bax0jayz couldn't decide on a movie to watch so she selected this. She reasoned, "It has several sequels. It MUST be good!" 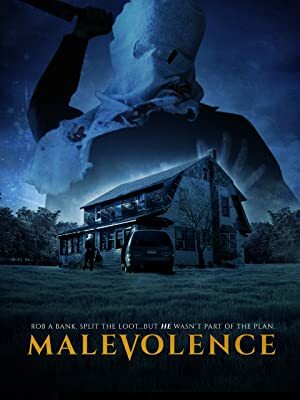 So a group of people get together to rob a bank, split up in two cars to confuse the authorities and to meet up later at an abandoned house to split up the loot. Something goes awry along the way and the team ends up going toe-to-toe with a serial killer. The movie has a pretty low budget and it shows. It's crude. It's brutal. Strangely enough, the cast is mostly surprisingly good looking. Even the serial killer, who is some recluse, is young and handsome and clean cut. WTF?! The acting is generally weak and the premise leaves you hoping that NO ONE survives. How can you feel bad for a bunch of bank robbers getting killed? Plus, they do one dumb thing after another. I didn't care for this movie. It wasn't my cup of tea. But if you like bad horror flicks, it might be worth viewing.